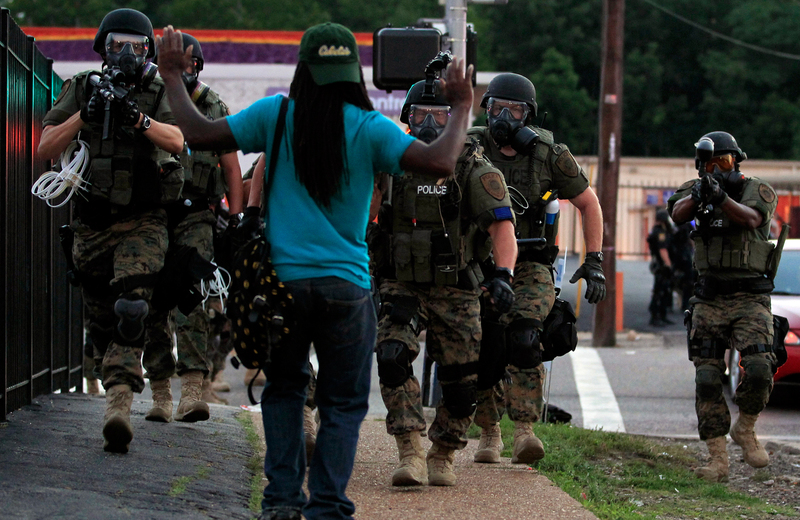 The events in Ferguson, Missouri, shed light on the increasing militarization of the police in the United States. When residents of Ferguson, Missouri, took to the streets to protest the killing of teenager Michael Brown by police officer Darren Wilson, they were met with assault weapons, armored vehicles, tear gas and police decked out in full riot-gear. A community already suffering the loss of one of its own found their town occupied by what appeared to be a paramilitary force. If the police looked ready to fight a war, it’s because that’s what their equipment was designed for. Much of it came courtesy of the Department of Defense’s 1033 program, which sends “surplus military equipment” to police departments. Since 1033 was introduced in the late 1990s, the federal government has sent $4.3 billion worth of military hardware to local and state police forces. The program has a particularly brutal effect on communities of color, as it is used primarily to execute the disastrous and racist “war on drugs.” While the images in Ferguson have just recently become familiar to many, police have long used SWAT teams outfitted in military gear to serve warrants for arrests for minor drug crimes, terrorizing whole communities and sometimes injuring or even killing people in the process. While it is crucial that we demilitarize the police, law enforcement doesn’t need tanks and body armor to terrorize communities of color. On her show on MSNBC, Melissa Harris-Perry reminds us how familiar Michael Brown’s story is, as she gives voice to nine black men recently gunned down by police officers and points out that between 2006 and 2013, white police officers killed a black person at least two times a week.